It simply cannot be true. The greatest rock group in the world, also known as Rheostatics, are calling it a day. According to their own site, they will play one last gig on 30 March 2007 and then... then, the world will be a poorer place. Now, I don't often get too concerned about what a group might or might not do. And in close to 100% of cases I'm darned pleased when an act calls it a day. Don't they all overstay their welcome? Well, this is a rare exception. On my last visit to Canada I picked up their last two records. 2067 is an incredible return to form, full of the usual punk-prog-electro-country-rock-folk vibe that has made Rheostatics so impossible to digest. This is a band you have to chew on for some time, and even then there may be some gristle to spit out. But that's how I like my music, even if it's condemned the group to semi-obscurity for two decades. Rheostatics are artists. Tielli does in-store painting gigs and the group made an album to accompany a Group Of Seven exhibit. Rheostatics are fun and produced a fantastic kids album. (It was pretty well like one of their regular albums, actually, except there was a narrative.) 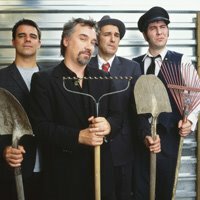 Rheostatics are documenters and have said more about Canada than most. Of course it must be mentioned that Bidini writes about hockey like no other. Rheostatics are historians and got Stompin' Tom out of hiding. Rheostatics are rockers and produced a double live album that transcended all others. Rheostatics are not afraid to make fools of themselves and not afraid even to take it all too seriously. The fact that this is the end is brutal news. That's all I can say. Buy their albums. Maybe start backwards, 'cause 2067 is brilliant and melodic and accessible. Then get Introducing Happiness, Whale Music, Harmelodia, The Blue Hysteria, in something like that order. When you've spent a few years digesting all that, get Double Live for a different take. You can do all this online at Zunior.